13 km North of Squamish at Alice Lake. Spend some time fishing, swimming or boating. If you prefer, explore the mountain trails. Be sure to take the binoculars, there are some awesome views. Maybe you would rather stay behind and find a grassy spot to relax. 88 campsites, showers, wheelchair access and a sani station. The park is located 55 km (34 mi) northeast of Pemberton via an access road from D'Arcy. The park provides the visitor with a campground, sani-station, boat launching facilities, hiking trails and good beaches. Moose, deer, black bear, marten and bobcat are resident in the park. Nearby Felix Creek is a bird watchers paradise. The lake provides good fishery for Dolly Varden, kokanee and rainbow trout. Open from May to September. This 15 campsite park is situated 47 km North of Squamish. The surrounding mountains and waterfalls make stunning photographs. This is a great base from which to hike and discover nature. Nearby Daisy Lake and the towering mountains of Garibaldi Park make a scenic backdrop. Located 64 km (40 mi) southeast of Chilliwack via a paved/gravel access road off of Highway 1, this park provides the visitor with a campground, picnic area, good beaches and excellent fishery for kokanee, Dolly Varden, cutthroat and rainbow trout. Open from May to October. The park is 656 hectares located 13 km south of Chilliwack. Turn off of the Trans Canada Highway on to access roads to the parks entrance. Four campgrounds with water, toilets, showers and firewood are located throughout the park: Clear Creek (80 sites), Delta Grove (58 sites), Entrance Bay (52 sites) and Maple Bay (106 sites). Picnic areas, a sani-station and change houses are provided. Located just 12 km from downtown Vancouver via the Lions Gate Bridge, this 3000 hectare park is bordered by Howe Sound, Mount Strachan, Hollyburn Mountain and West Vancouver. You'll enjoy an excellent view of Vancouver, Mount Baker, the Gulf Islands and Vancouver Island. Cypress Ski Resort and the miles of hiking trails attract make this a popular spot. Wilderness camping is permitted. 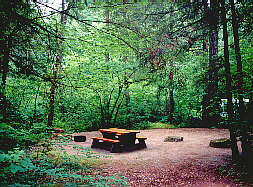 Picnic grounds are located throughout the park. Desolation Sound Marine Provincial Park Desolation Sound is located north of Powell River and Lund on BC's Upper Sunshine Coast; 90 miles north of Vancouver. Desolation Sound Marine Provincial Park is comprised of 5,666 hectares (14,000 acres) of forested upland and 2,570 hectares (6,350 acres) of foreshore and is one of British Columbia's largest marine parks. This, in combination with the areas adjacent to Desolation Sound, makes for one extremely large ocean playground. Travel north of Hope 18 km on Hwy 1. The park offers 34 campsites. Wander along the banks of the historic Fraser River and explore the forest. For your convenience, there's a public telephone and restroom facilities. A stunning 195,000 hectares of wilderness: mountains, glaciers, lakes and rivers. Most regions of the park are accessible only by mountaineers and cross-country skiers although there are five areas with visitor-oriented facilities. World famous Whistler and Blackcomb Ski Mountains are located near the park. A number of access roads along Highway 99 between Squamish and Pemberton lead to various park entrances. The park is situated in the Coast Mountains, near Maple Ridge. There are two campgrounds near Alouette Lake which provide water, toilets, showers and firewood: Alouette (205 sites) and Gold Creek (138 sites). Fishing and hiking are popular. A picnicking and day-use area with wheelchair access is available. Change houses are provided near the beach. A sani-station is located on the main access road. A truly lovely spot on the banks of the Fraser River. Located just 29 km north west of Chilliwack, plan a picnic or a stay in one of the 22 campsites. Be sure to visit the nearby General Store Museum. Step back in time as you visit this country store. Open all year round, Kilby Historic Site is a Fraser Valley jewel. While no longer operated as a provincial park since 2002, a small community based non profit, volunteer society operates both the museum and campground. A boat launch is also available. For more info visit www.kilby.ca. Situated in the Cascade Mountains of southeastern BC, the park encompasses over 66,500 hectares of rugged mountains, valleys, meadows, lakes and rivers. Highway 3 runs through the park. Nearby centers include Hope, which is 26 km west of the park and Princeton, 48 km east. Enjoy hiking, fishing, wildlife & wildflower viewing. There are four campgrounds within the park, each providing water, toilets and firewood. Wilderness camping is permitted in designated areas. Picnic areas and a good beach are available. The 3508 hectare Mount Seymour Provincial Park is located 30 minutes northeast of downtown Vancouver. The park encompasses Mount Seymour, Mount Elsay and Mount Bishop. Wilderness camping is permitted throughout the park. A group campground is located near the parking lot and four picnic areas are provided for day-use. An extensive trail system leads to the parks scenic attractions. Self-guiding nature trails explain the parks natural history. Mount Seymour Resort provides access to its ski runs with four chairlifts and a tow. Nairn Falls is not to be missed. The waterfall that this park draws it's name from plummets over 50 metres into the valley below. Cast a fly line into nearby rivers or hike through the conifers of a B.C. forest. This campground can accommodate 88 units and offers a sani station. Located 8 km east of Hope, this small provincial park offers camping sites for 9 RV's or tents. While you are there, be sure to try your hand at fishing in the Nicolum River. The park is located where B.C. 's Highway 99 and Washington states's Interstate 5 meet at the Canada/United States border. The Peace Arch sits on the International Boundary and is dedicated to the lasting peace between the two countries. There are 41 picnic tables throughout the park and an indoor picnic shelter which is available for large groups to rent. A playground is located near the picnic shelter. Bring your camera, the gardens are always spectacular in the spring and summer. The oceanside communities of White Rock & Crescent Beach are just minutes away. Located about 9 km from Britannia Beach, this 59 site campground fronts on the southmost fjord in North America. You'll camp right on the waterfront and enjoy a panoramic view. This modern facility offers showers, picnic areas, hiking trails, swimming, boat launching and fishing. Wheelchair accessible. At Princess Louisa Inlet massive mountains rise out of the water to heights of 2100 metres (7000 feet). In spring, waterfalls cascade down. The park is accessible only by boat or aircraft. It is located off of the Jervis Inlet which branches inland off of the Strait of Georgia. Wilderness campsites are provided with toilets and picnic shelters nearby. Mooring buoys, boat and dinghy docks are provided. Walking trails provide access to nearby scenic features. Located off of Highway 97 near Maple Ridge, the parks namesake lake was named for James and Fanny Rolley who homesteaded on its shores in the late 1800's. The park provides the visitor with a campground, picnic area and hiking trails leading to the areas historical features. Canoeing and/or angling in Rolley Lake prove to be rewarding pastimes. The park is located north of Harrison Hot Springs bordering on Harrison Lake. There are over 175 tent sites available is three separate campgrounds. A sani-station, boat launching ramps, and hiking trails are provided. This is a popular fishing spot. SILVER LAKE PROVINCIAL PARK A small undeveloped lakefront area 12 km Southwest of Hope. Silver Lake Park offers a gravel boat launch and plenty of scenic beauty. This area is renowned for it's fly fishing and canoeing. There are a number of other good fishing lakes and streams nearby. Situated approximately 46 km Southeast of Hope, Skagit Valley Park offers a total of 131 RV/tent campsites distributed between two campgrounds; Ross Lake and Silvertip. Hike the valley or wade knee deep in the Skagit River with your fly rod. There's boat launching, fishing and swimming in Ross Lake. The Stein Valley area has for centuries had a very special and spiritual meaning to the aboriginal people in this region, and has many unique pictographs and petroglyphs. 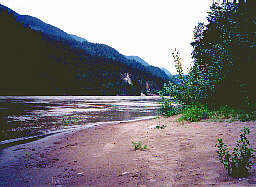 The Stein Valley Nlaka'pamux Heritage Park is jointly managed by the provincial government and the Lytton Indian Band. To reach the Stein Valley from Vancouver, take the Trans Canada Highway (Highway 1) that will take you to Lytton, located in the High Country Tourism region, and easy access. Or you can gain entry to part of the Stein Valley by taking Highway 99, the Sea to Sky Highway, from North Vancouver to the Pemberton Valley/ Mount Currie Area. The Sunshine Coast is located along the Strait of Georgia from Howe Sound to Desolation Sound. Numerous bays and inlets create protected ocean beaches and lagoons with many provincial parks. There are a good assortment of vehicle accessible and marine only parks. The Coast Range Mountains loom above the Sunshine Coast. This is one of BC's best sport fishing areas. Ferries provide the main access to the Sunshine Coast. Ferries leave from Horseshoe Bay Terminal.